At the time of the last post, Hurricane Harvey had pounded the Texas coastline with high winds and lashing rain. Witnesses reported that the rain in their faces felt like the output from a power washer, and every drop caused stinging pain. By the time the storm had dissipated, many longstanding flood records had been smashed, Houston was underwater, and hundreds of thousands of people had been driven from their homes. The amount of rainfall from this storm was simply astonishing. 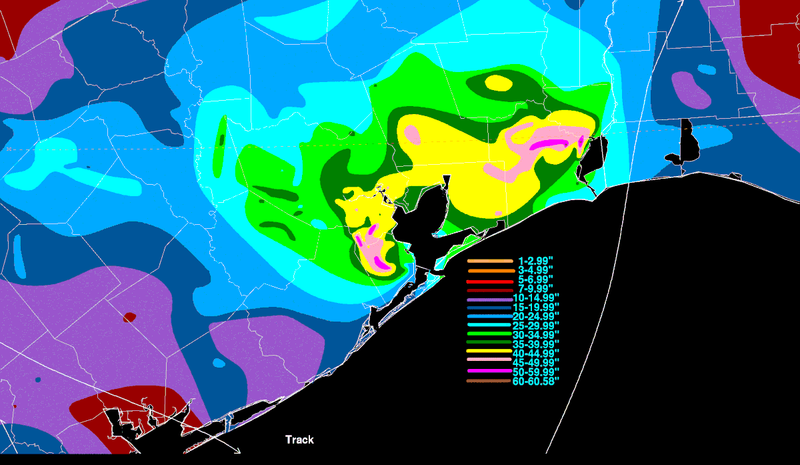 Precipitation levels during the three days of the storm were measured in feet, not inches. The previous record for flooding in Buffalo Bayou, which stretches into Houston, was bested by 14 feet! Many areas received an entire year’s worth of rainfall in a couple of days. The worst fears of local people were surpassed, and by a lot. And even when the rain had finally stopped, the flooding had not. The flooding after the storm came from two reservoirs that had been built to prevent the very situation they were now causing! Originally, the Addicks and Barker reservoirs were built well outside of Houston, in an area that was relatively undeveloped. The intention was that the reservoirs could contain a massive amount of precipitation during hurricanes and large storms, leaving the Houston metropolis protected. In recent decades, however, developers have been permitted to sprawl new communities right up to the massive earthen berms that hold back the billions of gallons of water. On the far side of the lakes, new neighborhoods rise up from the banks … but without sufficient elevation to escape inundation when the lake level rises. During Hurricane Harvey, these two lakes filled to the point where the water could no longer be contained at all. The water had to go somewhere: it had to either be released through the emergency sluice gates, rise up into the neighborhoods that ring the lakes, or flow over the berm itself. At some point after the storm, all three of these things were happening in an uncontrolled fashion. At this point, the Army Corps of Engineers (ACE), who operate the reservoirs, made the only decision they could make: the gates were fully opened to drain the lakes. The ACE now estimates that the gates will need to remain open for weeks, if not months … all the while continuously flooding homes in the path of the lakes’ surplus water. What happened? How is it that the plan to protect Houston resulted in disaster to so many? Most of the homes that enjoyed a lake view for so many years are now underwater, and will remain so for the foreseeable future. Sadly, many of these homes are not covered by flood insurance, because it was not legally required in the “500-year floodplain” where they are situated. But disastrous planning (or lack of it) resulted in huge swaths of watershed areas that were paved, covered by homes, driveways, patios, parking lots, swimming pools, basketball courts, streets, and other surfaces that shed water rather than safely absorb it. All this poorly-planned development was permitted to cover the formerly green zones that surrounded the lakes, and now MUCH more water than before is being dumped into the lakes as it runs off the impermeable surfaces. This situation, combined with the fact that 500-year floods have been occurring with alarming frequency, means that owning one of these lake-view homes is anything but enviable. Texas, known for its distaste for government regulation and federal “interference” is now learning the price of rampant, unregulated growth. This entry was posted	on Monday, November 27th, 2017 at 12:29 pm and is filed under Flood Protection. You can follow any responses to this entry through the RSS 2.0 feed. You can leave a response, or trackback from your own site.